I have never had a more cooperative cat than Dorito. He could not wait for me to get up to him, so he came down to me. He came down only a few feet, but that is a long distance for a cat going straight down a tree. He got in my lap, crawled up on my shoulder, and, most surprisingly of all, he voluntarily jumped into the rescue bag by himself. I did not have to stuff him into the bag. He willingly jumped into it all on his own. 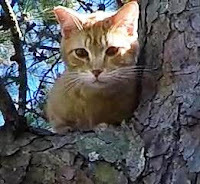 Dorito is a 4 year old orange tabby who is an indoor cat, but he slipped out one afternoon and climbed the pine tree in his backyard. 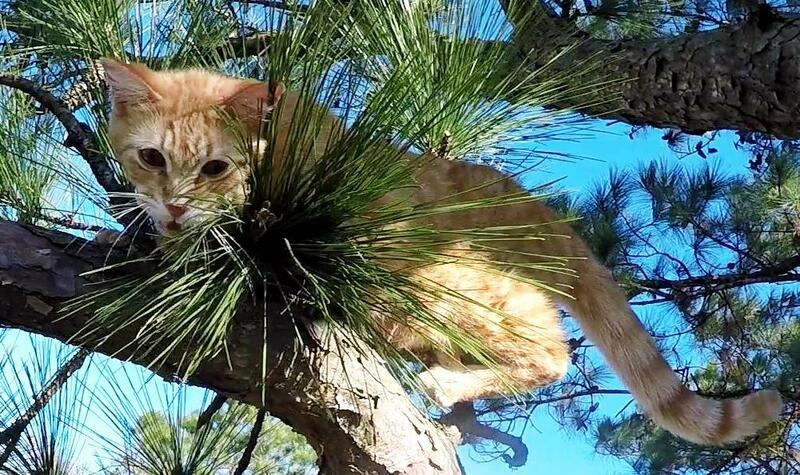 His human family and friends did everything they could think of to help him down. They even managed to convince the chief of the fire department to come out, but, not surprisingly, he could not do anything to help. When I arrived, he had been in the tree one very cold night, and I found him almost 50 feet high crying for help. I had a very difficult time getting my rope into the tree. Every time I shot my throw-line into the tree, either a limb would deflect it off course or the line would get snagged in the bark and twigs. I spent way too much time trying before I finally gave up and took the one branch I was able to successfully claim even though it was well below Dorito. I would just have to climb as high as I could and then advance my climbing line in stages to reach him. As Dorito saw me approaching him, his cries became more excited. I could see by his behavior that he wanted to come down closer to me, and I was very glad to see that. When I was just a few feet below him, I prepared to advance my climbing line so that I could get closer to him. But Dorito could not wait. 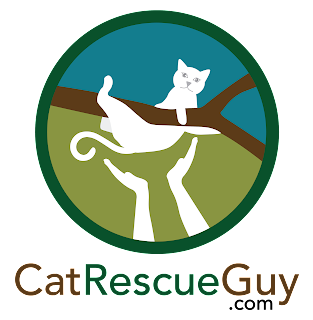 He could sense an opportunity for rescue, and he was not going to miss it. He found the courage to jump down to the next lower branch just within my reach. Then he came down to the next branch where he was now level with me. He walked onto my lap and even climbed up on my shoulder. I prepared the rescue bag for him by opening it fully and clipping it to my harness. Dorito was very interested in that bag, so he walked across my lap and peered inside. Whatever it was he saw, he found it very inviting. He stuck his head into the bag and then jumped all the way inside. All I had to do was close him up and take him down. It doesn't get any easier than this. 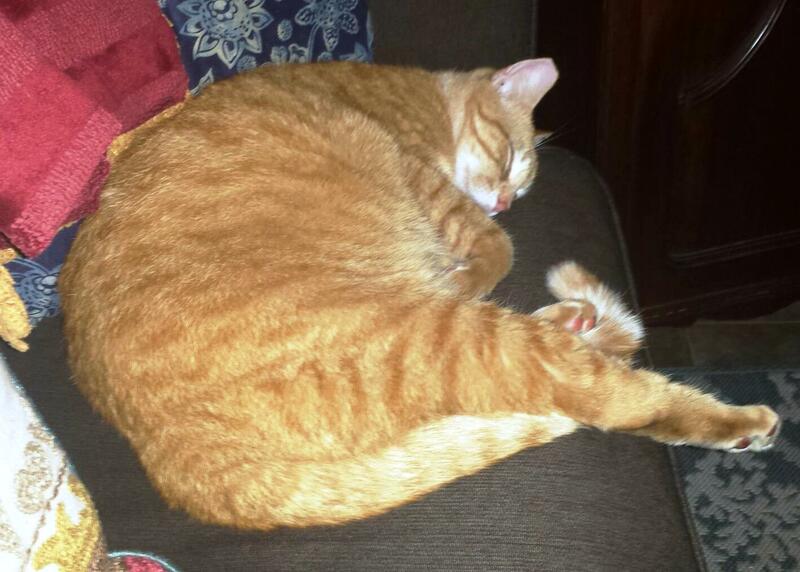 Later that evening, Dorito's family sent me this picture of him as he was recovering from his stressful ordeal. It warms my heart to see him safe, comfortable, content and sleeping so soundly. He needs that sleep. Sleep well, Dorito.